Increasingly, contemporary artists have been exploring the interplay among the function, structure, and format of books. Rebound: Dissections and Excavations in Book Art brings together the work of five mixed-media artists from around the world who, using books as a point of departure, sculpt, scrape, bend, and carve to create astonishing compositions. 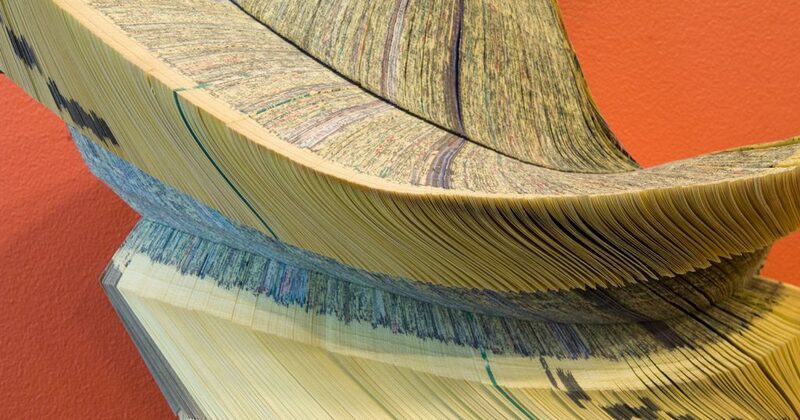 Doug Beube, Long-Bin Chen, Brian Dettmer, Guy Laramée, and Francesca Pastine transform various types of literature and/or printed books through sculptural intervention. Despite the individual and exclusive perspective of each artist, there are remarkable connections in the themes and ideas they respectively mourn and celebrate. The fascinating range of examples, as diverse as books themselves, offers eloquent proof that—despite or because of the advance of digital media for sources of information—the book’s legacy as a carrier of ideas and communication is being expanded today. For generations, our society has been lamenting the loss of natural beauty and the dwindling of Earth’s resources to the rising tide of industrial and technological “progress,” all in the name of greater efficiency and luxury. With this emphasis on technology, the relevance of physical books in our culture is diminishing. Books as a vessel for accessible and easily communicated knowledge are becoming somewhat antiquated. The tangible, permanent information presented in books is quickly being replaced with digital media and the Internet, which exemplify fluidity and constant change. In our ever-evolving digital present, we see a variety of once cherished technologies losing their importance and luster at an increasingly rapid rate. Because of the confusion and sense of loss that emerges from this state, the artists in this exhibition have created their own responses. Some, like Chen and Laramée, directly address the parallels between the disappearance of natural spaces and books as an outdated mode of expression; as a result, they carve landscapes from the pages and bindings. Deep crevasses, hidden caves, and awe-inspiring phenomena and landscapes emerge from chiseled pages. Alternately, some artists, like Beube, Pastine, and Dettmer, seek to find a place for books in the future, by digitizing or technologizing them. Here, images are created that are reminiscent of topographical maps, weather maps, readings from seismographs, or cross sections of the “bodies” of the books. These works are treated as surgeries or dissections; scalpels and needles are used to carve away the books’ exteriors. Brian Dettmer’s precise excavation of books, page by page, focuses on taking something that already exists and introducing alternate histories and memories that reveal and illuminate new relationships. Long-Bin Chen combines the cultures of the East and West in his blend of sculpture and literature. Through this, we are prompted to examine the eternal vexation of communication and the social relationship we enjoy with books. Guy Laramée’s work plays heavily on the idea of erosion, in that knowledge could very well be an erosive process rather than an accretion. In that light, he brings up the human fascination with the content of consciousness. In turn, he examines not what we think about, but that we think. Utilizing the glossy publication Artforum, Francesca Pastine reveals the visceral topography of art trends by means of an unsolicited collaboration with the magazine and the cover artist. Doug Beube explores the book as an object, a seemingly antiquated technology that is still purposeful in the digital age. He accepts its limited capacity as a personality flaw, but, moreover, acknowledges its elegance. The importance of the book is remarkably ingrained inhuman psychology. It may be a simple carrier of information, yet even today it is treated as an object of great value. Books represent our desire to record, organize, and preserve the details of our existence. Through each artist’s interventions, the book becomes even more sacred. For many of the artists, the historical and narrative value of the chosen material drives the pieces, and, by intimately getting to know the book they are working with, they are able to return it to a new life without destroying it. In the face of unsettling changes, these artists appeal to a sense of monumentality in their work. The references to nature, religion, science, or cultural complexity allude to the idea that only concepts of the greatest importance stand the test of time. Despite the emphasis on the precariousness of human invention, these works do not display a completely bleak outlook on society’s changes. The variety of color, form, and openness of composition among the works also celebrates the ingenuity of creating something new from something old. Books may seem under siege, but they are more realistically at a moment of transition. The artworks in this exhibition simultaneously celebrate and forewarn the viewers of the fine line between monuments and ruins. Doug Beube looks at the book like an inter-connecting block of wood. The codex, which, in Latin, literally means wooden block, is undeviating in its essential form and undeniably limited in its capacity to store and generate information. Theoretically and physically, he excavates the book, as if the text block itself is an archaeological site. Beube uncovers internal layers and exploits the inflexibility of the codex. By altering the book’s inevitable course, we are forced to read non-linearly. When Beube interacts with books, sometimes their words are readable, sometimes their shapes are recognizable, but in every case they are transformed into sculpture. Through the use of various power tools, the pages and text of the altered book are reconfigured into abstract forms. Beube’s work resembles the nonlinear way we now absorb information. He applies quasi software functions, such as cutting, pasting, and creating hyperlinks onto an analog system. With the guts of the exposed book, the texts are suddenly contrasting, skipping randomly from page to page, moving from one set of ideas to another. His bookworks are no more arbitrary and partial than much of the literature that Beube selects, which promises to deliver the essence of contemporary existence in a relatively small sum of words and pictures. To learn more about Doug Beube, please visit www.dougbeube.com. Tract_animation_titles_final from Halsey Institute on Vimeo. Doug Beube received a MFA in photography from the Visual Studies Workshop, Rochester, New York, and a BFA in film from York University, Toronto, Ontario. In addition to being a mixed-media artist, he is an independent curator, and the curator of a private collection for Allan Chasanoff, in New York. Entitled The Book Under Pressure, it employs the book for purposes other than its utilitarian form. Beube teaches classes in mixed media, artists’ books, and photography, and is invited to lecture at universities and art programs throughout the year. He teaches in the photography department at Parsons The New School for Design, and is a graduate advisor at the School of Visual Arts, New York. He exhibits both nationally and internationally, and his bookworks and photographs are in numerous private and public collections, including the Brooklyn Museum of Art, Brooklyn, New York; Museum of Modern Art, New York; New York Public Library, Byrd Collection; Walker Art Center, Minneapolis, Minnesota; National Library of Canada, Special Collections, Ottawa, Ontario; and the Black Eagle Apothecary Museum–Istvan Kiraly Museum, Budapest, Hungary. Long-Bin Chen explores different cultural meanings, and seeks to combine ideas and concepts from the East with those of the West. He incorporates such Asian iconography as Buddha heads and Japanese warrior figures, as well as imagery from other cultures, into his work. He chooses to work with local printed material from the communities in which he is an artist in residence, including telephone books, magazines, and other cultural debris of our information society. At first glance, the sculptures appear to be stonework, and most viewers are surprised to learn that Chen’s sculptures are soft and made from paper. To learn more about Long-Bin Chen, please visit www.longbinchen.com. Long-Bin Chen received a MFA from the School of Visual Arts, New York, and a BFA from Tung-Hai University, Taiwan. He was the recipient of a Joan Mitchell Foundation Award, in 1996, and a grant from the National Endowment for the Arts, in both 1997 and 1998. He has exhibited widely in the United States, Germany, Taiwan, China, and Hong Kong. Recent solo exhibitions include Continental Express, Frederieke Taylor Gallery, New York; Burning Book, 798 Gallery, Beijing, China; icon & idea, Plum Blossom Gallery, Hong Kong; and Long-Bin Chen Book Art, Nou Gallery, Taipei, Taiwan. His most recent group exhibitions include Buddha Spur, Bochum Museum, Germany, and Do A Book, at White Space, Beijing. He is represented by Now Contemporary Art Gallery, Miami, and the Frederieke Taylor Gallery, New York. In this work, Brian Dettmer begins with an existing book and seals its edges, creating an enclosed vessel full of unearthed potential. Using knives, tweezers, pliers, and surgical instruments as his equipment, he carves one page at a time, interacting with the existing material, exposing each layer while cutting around ideas and images of interest. Nothing inside the books is relocated or implanted, only removed. Images and ideas are revealed to expose alternate histories and memories. Sentences are cut and peeled out to create new contexts and more fluid meanings for narratives. Dettmer cannot control what is on the pages, but he can control how he reacts to it. His work is a collaboration with the existing material and its past creators. The completed pieces expose new relationships of the book’s internal elements, exactly where they have been since their original conception. Dettmer’s work demonstrates how books and printed matter continue to develop and redefine their form and function. Repurposing encyclopedias and other antiquated books, such as dictionaries, he shows us, in very literal terms, what a book might look like if modified to suit the haphazard, multidirectional structure of the Internet. The rigid rectangle of the book dissolves into a chaos of new connections. To learn more about Brian Dettmer, please visit www.briandettmer.com. Brian Dettmer received a BA from Columbia College, Chicago. He has had solo shows in New York, Chicago, Miami, San Francisco, Atlanta, and Barcelona. His work has been exhibited at galleries and museums throughout North America and Europe, including the Museum of Arts and Design, New York; Renwick Gallery of the Smithsonian Institute, Washington, D.C.; Museum of Contemporary Art of Georgia, Atlanta; Chicago Cultural Center, Illinois; and Museum Rijswijk, Netherlands, among many others. Dettmer’s work has been featured on the CBS Evening News and National Public Radio, and in The New York Times, The Los Angeles Times, The Guardian, Chicago Tribune, Art News, Modern Painters, and Wired, among others. In 2012, he had a solo show in Maribor, Slovenia, as part of its celebration as the European Capital of Culture. Dettmer’s work is in the collections of the Art Institute of Chicago; Cleveland Institute of Art, Ohio; High Museum of Art, Atlanta, Georgia; Museum of Contemporary Art of Georgia, Atlanta; San Jose Museum of Art, California; and Smithsonian American Art Museum, Renwick Gallery, Washington, D.C. Elemental, Dettmer’s solo show, which debuted at the Museum of Contemporary Art of Georgia, is traveling around the U.S. through 2013. Guy Laramée begins with vintage books and transforms them into stunning landscapes. He is attracted to the timeless qualities of nature. There is a spiritual element to his ideas and approach, and it is reflected in the contemplative serenity of his altered books. His work originates from the concept that one gains true knowledge through erosion, not accretion. The work sparks such questions as: Is there too much data? Are we drowning in a sea of answers? Why are we obsessed with knowing so many things? Could you know more about the world by knowing less? Are we losing ourselves? In his work, mountains of disused knowledge return to what they really are—mountains. They erode a bit more and they become hills. Then, they flatten and become fields, where apparently nothing is happening. Piles of obsolete encyclopedias, inevitably, do not need to say anything. Laramée’s work is about making us feel more alive. It is about feeling this incredible force that won’t stop after your body dies—that will keep inventing new forms, new species, new opportunities. It is about opening your eyes, as if for the first time. It is about losing yourself in the landscape and, paradoxically, finding that you are the source of it all. To learn more about Guy Laramée, please visit www.guylaramee.com. Guy Laramée received a BFA and a MA, in anthropology, from Concordia University, Montreal, and a MA, in visual arts, from UQAM, Montreal. He has received more than thirty arts grants, and was awarded the Canada Council’s Joseph S. Stauffer Award for musical composition. His work has been presented in the United States, Belgium, France, Germany, Switzerland, Japan, and Latin America. Parallel to his artistic practice, he has pursued investigations in the field of anthropology. Ethnographic imagination is an important characteristic of his artistic work. Although his work has been presented in museums and galleries, its appearance in the context of a gallery exhibition is relatively new. Laramée’s work can be found in the public collections of Yale University Art Gallery, New Haven; Museum of Art and Design, New York; Acor Library, Amman, Jordan; Musée National des Beaux-arts du Québec; Bibliothèque Nationale du Québec; and numerous private collections. Francesca Pastine creates beautiful sculptural interventions using Artforum magazines as her medium—familiar fixtures in many galleries and artists’ homes. Starting with the covers, she cuts, bends, manipulates, pulls, and digs her way through, revealing a visceral topography of art trends. Foregoing any use of glue, wires, or staples, she lets each arrangement stand on its own. Her X-Acto blade mimics a pencil, but she subtracts rather than adds. Her carvings form colorful sculptural pieces that seem to melt down the wall as each page folds onto itself. Pastine attaches the work to wood panels and covers them with a Plexiglas box, enshrining the magazine as a cultural relic. The finished work becomes an unsolicited collaboration with the magazine and the cover artist. By recontextualizing and subverting the content, Pastine has inserted herself into the larger global narrative. The arts and culture publication Artforum may be used to comment on the world of museums and galleries, but now it is elevated into a work of art itself. When featured on gallery walls, Artforum becomes the subject of criticism and adoration instead of being merely a commentator. To learn more about Francesca Pastine, please visit www.bearclaw.rexx.com/~fpastine/. Pastine received a BFA, in 1993, and a MFA, in 1996, from the San Francisco Art Institute. She was the recipient of a Pollock Krasner Grant, in 2009, and a Kala Fellowship, in 2011. Her work has been shown at galleries, art spaces, and collections nationally and internationally. Most recently, she had a solo exhibition at Pentimenti Gallery, in Philadelphia, and at Eleanor Harwood Gallery, in San Francisco. Upcoming exhibitions include The Book Under Pressure: The Allan Chasanoff Bookwork Collection, curated by Jock Reynolds for the Yale University Art Gallery, New Haven, Connecticut; 10 Years: Artist’s Book Biennale, curated by Luc Brévart, Arras, France; and Considering the Kylix: Contemporary Interpretations of a Classical Form, curated by Brienne Rosner, Peter’s Valley Art Gallery, Layton, New Jersey. Pastine’s work is represented by Eleanor Harwood Gallery, in San Francisco. She has taught at the San Francisco Art Institute, California College of the Arts, City College of San Francisco, and Diablo Valley Community College.